New York (TADIAS) — PM Abiy Ahmed met with members of the Ethiopian Diaspora community at a reception held at the Ethiopian Embassy in Washington D.C. on Thursday, July 26th as he started his three city tour of the United States this week that will take him to Los Angeles, CA on July 29th and Minneapolis, MN on July 30th as well. 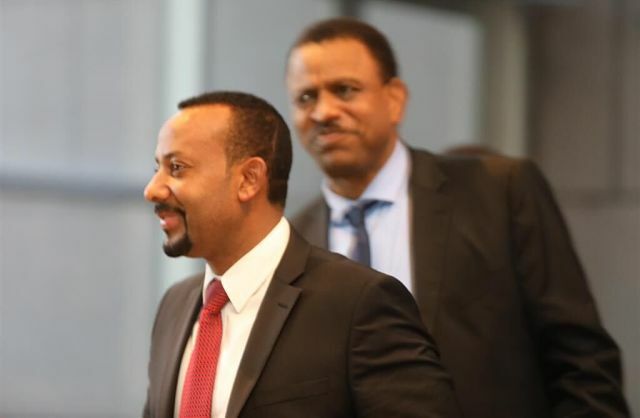 Earlier in the day PM Abiy met with religious leaders and took part in the peace and reconciliation event between the exiled synod of the Ethiopian Orthodox Tewahedo Church and the synod in Ethiopia during his visit to Washington DC. The churches were reunited after almost three decades of separation. When PM Abiy arrived at the embassy there was a lone protester holding the Ethiopian flag. The prime minister approached the protestor, inquired about his concerns and insisted that he will not go inside unless he joins him. It’s not clear what the person was protesting, but he was later seen having a good time at the reception inside. Thousands are expected on Saturday, July 28th at the Walter E. Washington Convention Center in D.C. as PM Abiy hold his first public address greeting the larger Ethiopian community at a free event open to all individuals.